Before, you watch the movie we share you an opportunity to know what Navin Awal has to say about 1 Percent with a short interview by us with him just before the release. What made you to write a script and direct 1 Percent ? For past few years I had been directing tv commercials and docudramas but beside that I was also practicing and studying film making through books and the internet and learning from my mistakes . And this year somehow I thought I should test my ability in film making . So I wrote and directed 1 Percent with the efforts I would put while making a feature film so that I could see if I'm ready for feature films yet. What is your short film majorly focused on ? Our core message from the movie is on HIV/AIDS which isn't the actual disease which we fear of. Rather, our problems lie on the unemployment, social unrest, the most growing and uncontrolled sextrade being the main threats as well. Being a director, i have tried to put some light on the window period which most of the youth are unaware of. Are you looking forward to take a next move with another one may that be a short film or a feature film ? It depends upon how my viewers will like my work .My viewers' responses will decide if ill make a short film or a feature film. While, i have started writing on three different genres. With no more delays now we allow you to watch the most awaited short film. 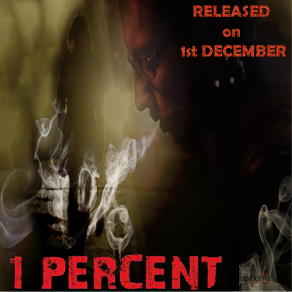 Share your feedbacks of the movie on the comments or at the official facebook page of 1 Percent.